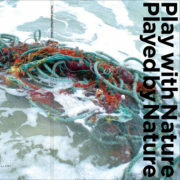 “Play with Nature, Played by Nature” Curated by James Jack. 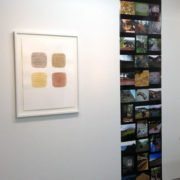 Works by Fumio Aono, Mary Babcock and Maika‘i Tubbs (left to right). 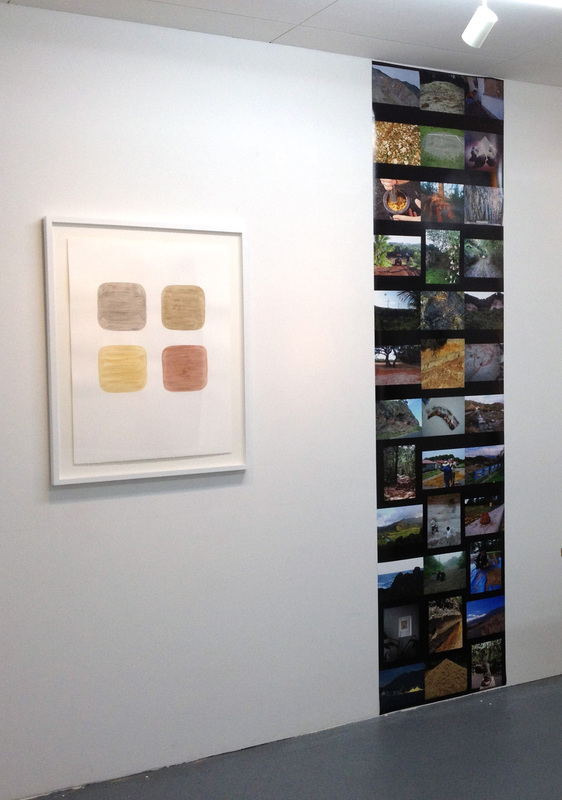 Works by Ringo Bunoan, Maika‘i Tubbs, Jackie Brookner and Fumio Aono (left to right). 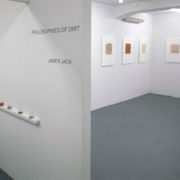 For additional information regarding the exhibition please see the gallery website or AAA archive. I have been working in Setouchi on the garden for Sunset House over the past three months for the Setouchi Triennial. Although this project has been about the relationship of the house with its surroundings over the past three years, the local stones utilized in the garden now make this relationship more clear. After discovering remaining basalt stones nearby the site of the former stone quarry in the town where this artwork is, I worked with the elderly population to reclaim these stones and create a walkway through the garden that leads in a meandering path to the entrance of Sunset House. These stones embody the wealth of the town as it was the first location for Osaka Stone Company starting in 1934 and continuing until 1989 when their operations in Kounoura town were put on hold. When I first started work on Shodo Island one of my strongest impressions were the currently operating stone quarries in Fukuda, the north area of the island, where the landscape is being carved by dump trucks, dynamite and cranes to mine granite stone. But contrary to earlier precedents where nature and industry are presented as clashing forces such as the film Koyaanisqatsi (1982) I saw these as sites composed of layers of distress, prosperity and emotions. While the most famous uses for stones from Shodo Island include the walls around Osaka Castle and the Tokaido Shinkansen tracks, far greater quantities of stone have been sent to dam construction sites than any other single use in the past century. Upon leaving the island yesterday I was reminded of the shifting landscape as I left on the ferry from Fukuda, observing once again the “squaring” of the landscape as a site where desire and trauma intersect. 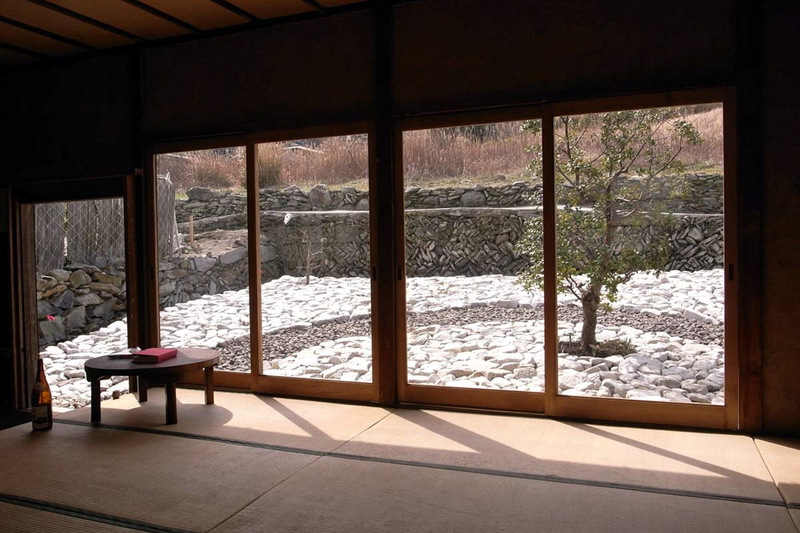 This is one of the reasons why I chose to construct the garden with granite from this area of Shodo Island: the contradictory nature of these stones and their shifting meaning in the surrounding habitat. This year I felt the need to include not only the bright side of the community (and myself) but also to find ways to express the more difficult aspects of life in this artwork. As I thought more about the garden as I first encountered it, images of broken glass, rusty metal and other garbage held a strong presence in my memory. 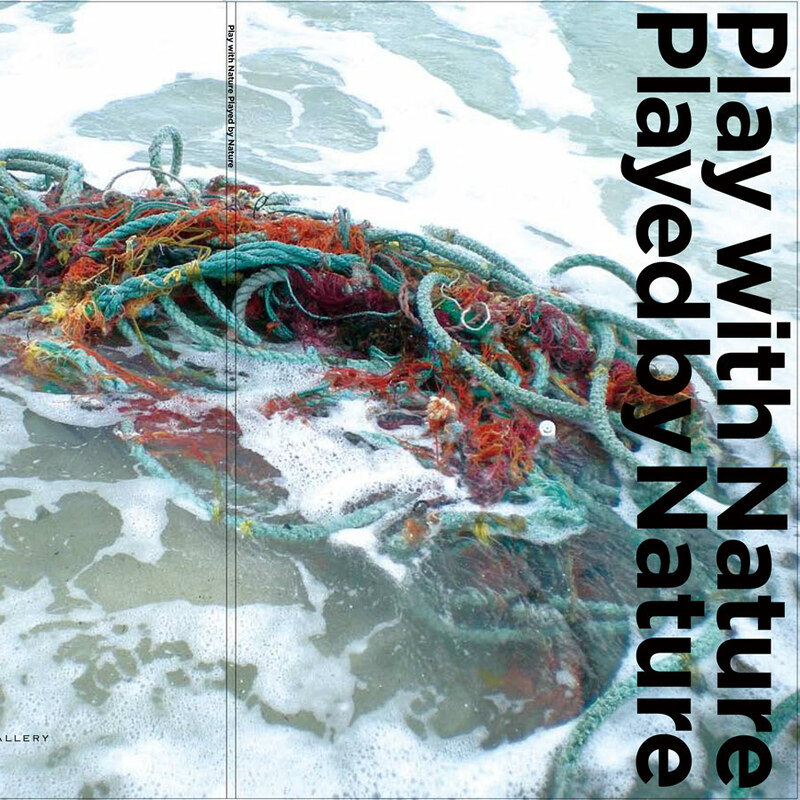 These waste products contain clues to our own lifestyles, to that which we do not want to pay attention to but that which we need to consider as it jeopardizes our connection to the environment. I thought about the heaviness of the stones and the sores in the land that leads to Sunset House. These characteristics also exist in the social landscape, the people who make this community, and so I asked them to record their feelings of sadness, stress, worry or discomfort onto the underside of the stones as they were arranged in the garden. This was a challenging task because many people are not familiar with vocalizing these feelings, especially in public, and now I was asking them to visualize the darker side in order to complete the garden. But after reflecting on the lightness of the white surfaces of these granite stones the relationship of lightness anddarkness slowly became clear. In fact the light, airy, cloud-like aspect of the surrounding garden for Sunset House would only be possible if we inserted our reality of trauma, distress and troubles into the soil. I felt these negative feelings created nutrients for the garden that would sustain it for many years to come. Rather than just covering the “dirty” soil that I found three years ago when visiting this site, together with one hundred people I rejuvenated the garden with energy that comes from what was considered waste but now becomes nourishment. Just as each stone holds the potential to become one in a castle, a train track or a dam- people too hold the potential to become key participants in a system for regeneration. I discuss some of these aspects in a recent radio interview on the project with Shima Radio which can be heard here. People have responded deeply to these contradictory aspects of the place in my work as this project is presented as part of the Setouchi Triennial opening this week. A video document on the history of the town, the layers of stories in the building and my engagement with the site for SUNSET HOUSE has been completed. It was premiered in Tokyo together with a reading by poet Brandon Shimoda for the event “O Bon, Memories and the Seto Inland Sea” last month. The video engages with forgotten histories such as a stone quarry in the town of Kounoura and the Mutsumi clubhouse which was the source for the building materials used to make this structure. 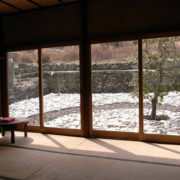 After making initial site visits to the island of Shodo in 2009 and beginning to work with the historic building in 2010 I literally felt stories were seeping from the walls of the building. Those stories were invisible but could be felt strongly while spending time in the community. The second stage of production at SUNSET HOUSE involved writing those stories on paper and affixing them to the mud walls. Now these memories, hopes and dreams are all inside the walls which have been closed with yakita, or burnt wood clapboards. This process is all documented in the following video document. This trailer is just a sample of the entire film which is just over 30 minutes long [Japanese/English subtitles are forthcoming]. Please contact the artist if you are interested in holding a screening of the film in a theater, cafe or gallery in your city. 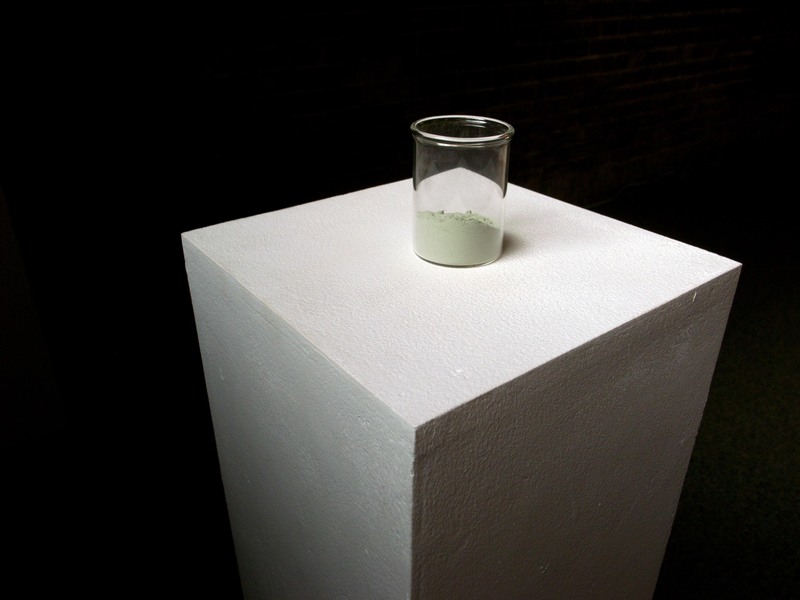 For more information about the artist please see the following digital portfolio from artists space. As an artist in residence on Shodo Island I have developed many new artworks, most notably the permanent installation work Sunset House. I began research for the work two years ago, redesigned the interior of the house last summer and have been at work on the exterior over the past four months. The site is charged with social history that became apparent to me through daily conversations with the elderly in the area. From their stories I realized that the pillars, roof tiles and other structural materials for this shed were originally part of the “Mutsumi Club” run by the Osaka Sekizai Company. After a typhoon nearly destroyed the clubhouse forty years ago it was relocated by the current owner and used as a storage shed for fishing nets, garden tools and other odd items. Since the owner has passed away over a decade ago the shed had fallen out of use and the space was becoming stale in the absence of a current use. While listening to the local people’s memories of drinking parties, tea gatherings and many breaks from work that took place at this clubhouse I realized the significance of my work in this specific place at this particular time. No different from most of the islands in Setouchi and the Japanese countryside in general, the population on Shodo Island is decreasing. For school, work, convenience and many other reasons young people are leaving the countryside for urban lifestyles and fewer and fewer couples are having babies. Towns such as Kounoura where I am undertaking this artwork show the signs of decreasing population very clearly. In some areas there are more empty houses than those being lived in and it is easier to find a car with an elderly sticker than one without. In the midst of this complex social history of the place I had to find a way to incorporate the memories, wishes and dreams of these people directly into my art installation. One of the first reasons I was fascinated by this particular shed of all the potential exhibition sites was its raw, cracking mud interior walls. Last year I preserved the characteristics of these walls while mixing white and black stone dust into the compound to create circular forms inside the wall surfaces. (More details of this stage from last year can be found on my website HERE.) This year I envisioned a similar form that suggested a circle for the exterior of the building, but chose to use materials that are commonly used in local architecture. Throughout the process of redesigning the exterior surface, I realized that people’s hopes, memories and wishes could all become an integral part of the walls themselves. 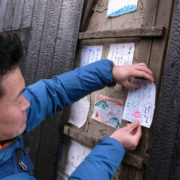 I asked the local elderly group to each write a remembrance, dream or wish on a small piece of paper. This became a way for me to learn more about the history of the site and the people living in the community. I soon realized that these wishes were a genuine way for the local community to gain an active voice in the heart of this artwork. 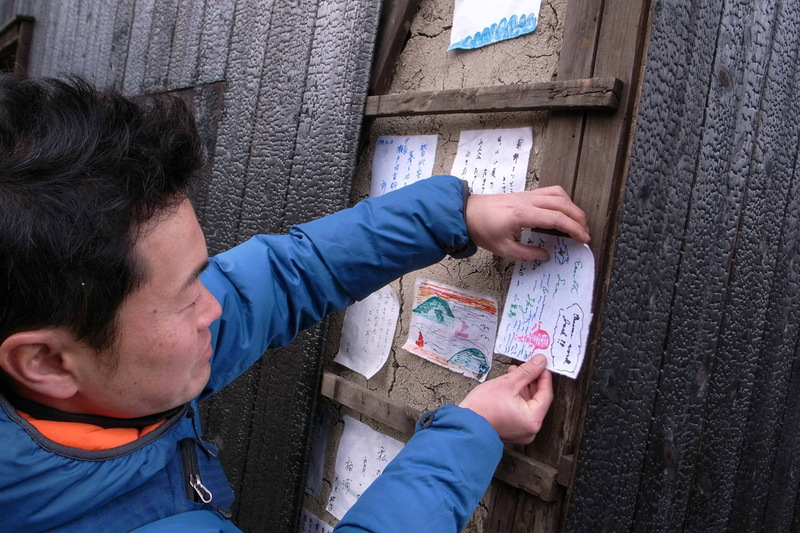 Therefore I chose to adhere their paper wishes directly to the mud walls of the building so it would be endowed with the hearts of all those who participate. The first challenge I faced was the question, “But what is the point if these wishes be covered up by the new wood surface?” In conceiving this artwork I did not want to make things obvious, but rather to suggest the larger existence of what is already there. For example, in drawing two circles into the interior of the structure I chose to draw fragments of two larger circles, one opening up to the sky and another opening to the earth in order to suggest that which lies beyond the architecture of the building itself. The same concept held true for the wishes, but even stronger. Precisely because they not visible on the surface of the artwork the wishes impress an emotional message on the mind. That which is obvious, in front of one’s eyes, does not need to be remembered because it is visible; but that which is invisible must be actively remembered, told in a story or represented in media such as photographs. These layers of meaning in the work evolved naturally from the materials and history of the site. Some adults were skeptical at first, but one by one the wishes started pouring in from all types of people. Some residents were so enthusiastic they wrote 3-4 sheets overflowing with creativity, poetry and personal thoughts. I held two workshops, one for a kindergarden class and another for an elderly club in which everyone recorded their memories of sunsets, hopes for the present and dreams for the future. The affixing of countless wishes to the walls recharged the site with a new energy related to its roots as a clubhouse. But instead the space is now transforming into a place where people old and young, local and foreign, can meet to appreciate nature just as it is. The materials for Sunset House reflect a deep connection between people and nature. 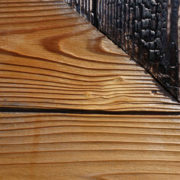 For example I have been working exclusively with yakita, or burnt clapboards, for the exterior of the surface. These clapboards are used to resist the harsh ocean breezes in the Setouchi Inland Sea and have a unique aesthetic appeal. But I felt the structure would become too dark if it were entirely blackened, so I struggled to find other natural materials that would lighten the exterior to a more balanced composition. I found that raw wood could give a rough appeal to the section of the building where I chose to draw a circular form while maintaining a harmony of material with the burnt wood used for all of the other surfaces of the building. Additionally I added a mud wall section around the building near the roofline to draw a closer link between the interior mud walls and the exterior of the structure. Similar to the mixture used inside, I formulated a mix of local stone quarry dust to lighten the local mud used for composing earthen walls. Like many towns on the Island of Shodo, the history of this town is full of stories of a stone quarry that brought great abundance to the people in the area. I have also been purely fascinated with earth pigments for the past ten years and often incorporate these pigments into my artworks. I will be presenting this work along with another site-specific installation titled Philosophy of Colors for an exhibition opening next week. There are still many components of the site I plan to work with in the future, therefore Sunset House will not be completed until 2013. 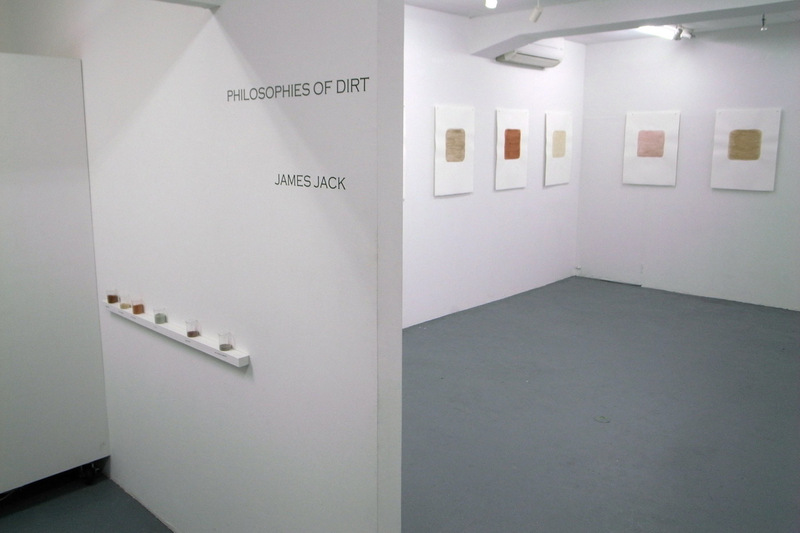 Both artworks will be open to the public starting on December 10th and the exhibition details can be downloaded HERE. In addition to the new exterior of the building, each paper wish will be included in a video projection on the interior walls of the building. The project has been covered by a number of Japanese reporters so please read more about Sunset House in these articles which can be downloaded here 園児ら作家を”お手伝い” and 子供との描く夕焼けハウス as well as a radio broadcaster who wrote about my work on her blog after a recent visit to the studio which can be linked HERE. For those of you who cannot make it to see the work this month please stay tuned because this is a permanent installation work that will be on display again in the future. I am developing a new project for Hokkaido that has been coordinated by the organizers of the exhibition Cycles of Memory (see flyer above). This project deals with the layers of earth and human consciousness, exposing the beauty of what lies beneath us. 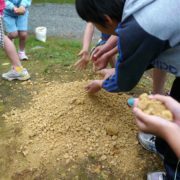 For this project soil will be drawn from a historical site in Hokkaido and redistributed on a mound near the exhibition venue in Tarumae. This movement of soil brings human daily labor into direct contact with the layers of soil that lie deep inside the earth, changing the color of a public site and exposing the history of a volcanic site. This project is tentatively titled Storied Landscape as people’s stories will be an integral part of the installation process, and the landscape itself will reveal people’s stories of the region and its history. I will hold workshops with the local community on July 20 and July 23rd and a public lecture is scheduled for July 24th at the Tomakomai Museum. I will be the Orvis Artist in Residence at the Honolulu Academy of Art starting this Saturday, May 14th. This work will be made specifically for the Academy utilizing locally available natural materials. 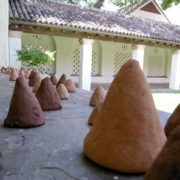 Natural pigment samples will be sculpted into handmade conical shapes in collaboration with museum visitors on Saturdays from 10-4:30 and Sundays from 1-4pm. 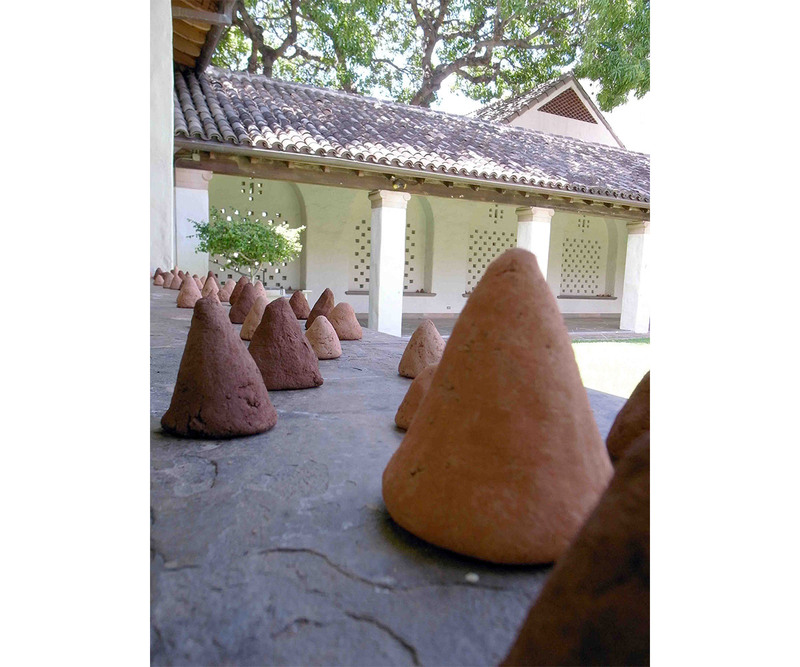 These cones will collectively form a miniature landscape that will be displayed outdoors in the Banyan courtyard. The cone-making process will be demonstrated in Gallery 30 and the public is invited to sculpt cones that will be a part of the outdoor installation. 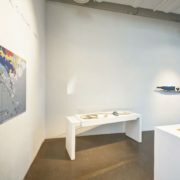 The goal of this work is to revitalize people’s connection to the land we live on, revealing the wealth and diversity of the soil via a site-determined installation. 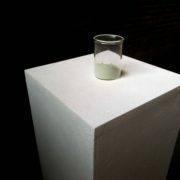 The work will slowly unfold over the course of my residency period from May 14- June 25th, 2011. Please come by and participate! More information can be found on the Academy’s website by clicking HERE as well as the AloHAA blog.